The NCAA Playing Rules Oversight Panel approved a change to the standard match format for the NCAA rifle qualifier. CHARLESTON, S.C. –– For the second time in program history, the Kentucky Wildcats are NCAA champions in rifle. Watch the recap from Day Two as Kentucky's Henrik Larsen won the Air Rifle finals at the 2018 NC Rifle Championship. Kentucky took home the title. Watch the full event replay of the Air Rifle finals at the 2018 NC Rifle Championship. 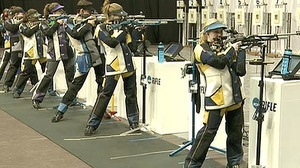 Watch the recap from Day One as West Virginia's Morgan Phillips won the smallbore finals at the 2018 NC Rifle Championship.